Human rights group Amnesty has accused the government of "going soft" on torture after court evidence given by the head of MI5 was revealed. Eliza Manningham-Buller does not specifically mention torture in a statement to the law lords about using intelligence information from overseas. But she says: "Experience proves that detainee reporting can be accurate and may enable lives to be saved." Her court statement was leaked to Channel 4 News. The law lords are examining whether the UK government should have to check whether intelligence it uses has been obtained by torture. Cooperation between the UK and foreign intelligence agencies has increased since the US terror attacks on 11 September 2001. Normally, the information is passed initially to MI6, which gathers foreign intelligence, and assessed for its reliability. Ms Mannigham-Buller says the provenance of such intelligence is often obscured by overseas agencies to protect sensitive sources or comply with their own laws. In some cases, it includes information from people in detention - called "detainee reporting" - but the MI5 chief says in her statement: "even then the agencies will often not know the location or details of detention. But such information can help save lives, she argues. She points to information from Algerian agencies who questioned a man called Mohammed Meguerba. The evidence led to a raid on a London flat and the eventual uncovering of the so-called ricin plot. There has been press speculation that Meguerba was tortured. But Ms Manningham-Buller says: "In those circumstances, no inquiries were made of Algerian liaison about the precise circumstances that attended their questioning of Meguerba. The Meguerba case "provides an example of full co-operation with our Algerian partners", she argues. She adds: "The international community has recognised the importance of co-operation between states in countering the threat from international terrorism. That co-operation includes the sharing of intelligence material. "Such material itself includes detainee reporting, which has proved to be very valuable in disrupting terrorist activity." Human rights groups insist using evidence from torture cannot be justified in any circumstances. Kate Allen, director of Amnesty International, said: "Let us be clear what we are talking about. This is not about whether evidence is useful. "This is about whether the UK will turn a blind eye to someone being thrown in a cell and having pain and terror inflicted upon them. "The UK authorities must of course do their utmost to protect the public from terrorism - but going soft on torture is not the answer." 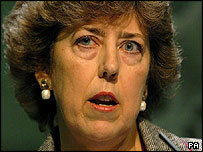 Shami Chakrabarti, director of human rights group Liberty, said: "As in the past, Dame Eliza Manningham-Buller is brutally honest about the murky and dubious world of secret intelligence. "However, it is one thing to recognise that some of our so-called allies torture people and quite another to legitimise that practice through our court system."